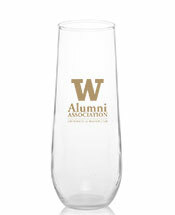 Wed. June 12, 2019 6–8 p.m.
New Class of 2019 UWAA members get a free commemorative champagne flute! Cheers to you! Join fellow grads at Sylvan Grove where we’ll raise a glass and welcome you into the UW alumni family. It’s the perfect event to begin your graduation celebrations and farewells. Don’t miss out on this growing campus tradition. This event is open to all Class of 2019 grads. All guests will receive one toasting beverage (champagne or sparkling cider) and an additional free drink. All ages welcome. Must have valid ID to attend. Complimentary glass of champagne (or sparkling cider) and light appetizers provided to all guests. Advance registration is strongly encouraged; walk-ups will be admitted as space allows. UWAA members get a free gift. What’s this about? You may remember when your orientation leader told you the story of the Sylvan Grove columns: How the columns are almost all that remains of the original UW campus near downtown, saved from the wrecking ball and brought to the UW, where they stand today as a symbol of the connection all Huskies have with the University, the alumni who have gone before and those who will come in the future. Then you were invited to come up and touch each column. Then hands off until graduation — It’s a tradition. Well, the time has come to return to Sylvan Grove and bring the tradition full circle with a toast the Thursday before commencement. The UWAA is proud to support this tradition, and thrilled to be among the first to welcome you into the UW alumni family. So raise a glass with us and celebrate!